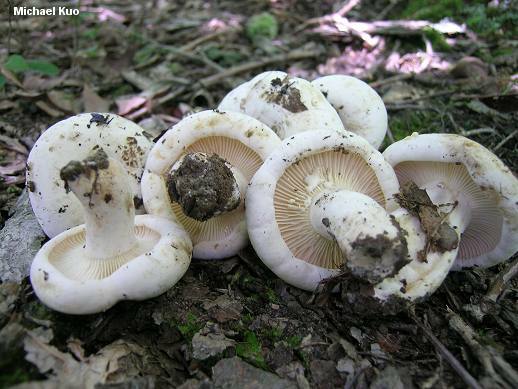 Among the many white species of Lactarius in eastern North America, Lactarius subvellereus can be recognized by the velvety feel of its cap and stem, the ever-so-slightly yellowing milk, the brown spotting gills, and the acrid taste. The cap does not develop brownish scales like the cap of Lactarius deceptivus, and the gills are not extremely crowded like those of Lactarius piperatus and Lactarius glaucescens. 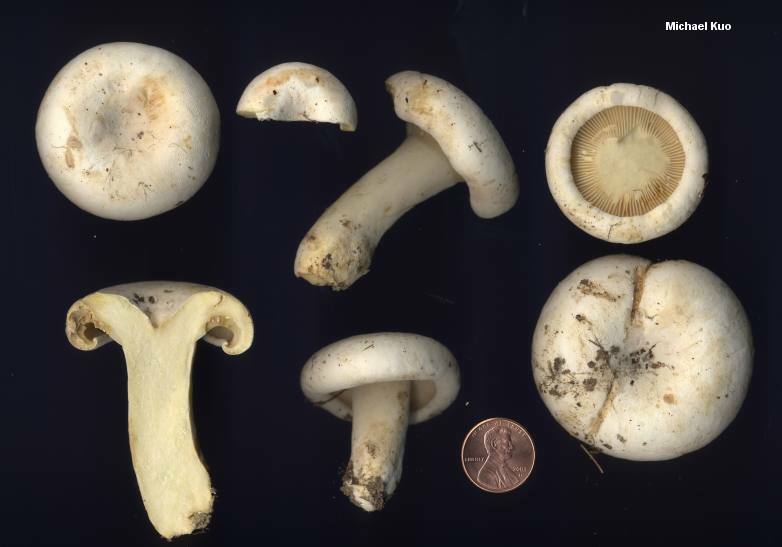 Charles Peck first described Lactarius subvellereus from Alabama, in 1898; he considered it distinct from the European species Lactarius vellereus, which discolors brownish and features mild milk (when tasted separately from the flesh). Peck's species had crowded gills; Hesler and Smith (1979) named Lactarius subvellereus var. subdistans, which is described here, to account for collections with well spaced gills. The vellereus-like species of Lactarius are obviously ripe for contemporary investigation. Lactarius subvellereus var. subvellereus has narrow, close gills. Apparently it lacks the orange reaction to KOH. Ecology: Mycorrhizal with oaks and perhaps with other hardwoods; summer and fall; widely distributed east of the Rocky Mountains. Cap: 4-15 cm; convex with a soft, inrolled margin at first; becoming flat or shallowly depressed; dry; finely velvety; whitish; consistently without concentric zones of color or texture. 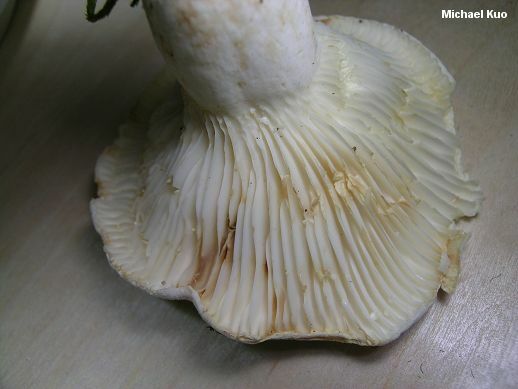 Gills: Attached to the stem or beginning to run down it; distant or nearly so; whitish, becoming yellowish; bruising and spotting slowly brownish. Stem: 2-5 cm long; up to 3.5 cm thick; more or less equal; dry; finely velvety; without potholes; whitish; sometimes bruising brownish. Flesh: White; changing to yellowish when sliced. Milk: White; changing to yellow or yellowish (often slowly, and only very slightly) on exposure; staining the gills brownish to pinkish brown; staining white paper yellow. Chemical Reactions: KOH pinkish to pale magenta on cap surface; orange on gills and on exposed flesh. Dried Specimens: Cap and stem buff white, finely velvety; gills cinnamon to orange-cinnamon. Microscopic Features: Spores 7.5-9 x 5-7 µ; broadly ellipsoid; ornamentation under 0.5 µ high, as isolated warts--sometimes nearly invisible, even with oil immersion. 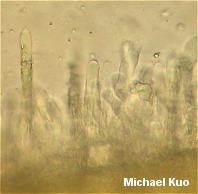 Pleuromacrocystidia up to 120 x 10 µ; subfusoid to subcylindric; scattered to abundant. Cheilocystidia similar but shorter; abundant. 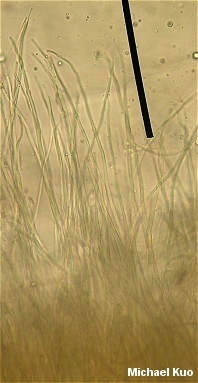 Pileipellis a lamprotrichoderm featuring a dense turf of upright, tapered, thick-walled pileocystidia measuring up to 200 x 5 µ.
REFERENCES: Hesler & Smith, 1979. (Smith, Smith & Weber, 1979; Montoya et al., 1990; Phillips, 1991/2005; McNeil, 2006; Binion et al., 2008.) Herb. Kuo 09029515, 08050304, 07150704, 07050805.